With more than 100 flavors on their full menu, it could take a long time to get the full flavor of Yummy Cupcakes, but our family made a solid dent in the project during a recent visit to California’s San Fernando Valley. 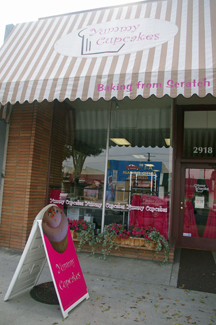 This 2-year-old family-owned bakery opened a second location in Santa Monica in March 2007, but we ventured to the original bake shop in Burbank. We visited in October, when Halloween offerings were abundant, with names such as Blood Orange, Devil Dog, Chocolate Chili and Pumpkin Seed. Freshly baked cupcakes were on display, and still more were coming out of the oven and being frosted before our bulging eyes. Prepped by an online menu, we quickly made our selection. There was no eating area, so when they asked if we wanted the cupcakes to go, it made my mouth ache to see those three luscious cakes packed into a white box, secured for transit with a dab of icing on the bottom of each wrapper. We made it as far as a nearby park before stopping to enjoy our cupcake take. Despite my urgings to try something more adventurous, our 3-year-old son chose Vanilla/Vanilla ($2.50), which actually proved revealing in its simplicity, as it highlighted Yummy Cupcakes’ exclusive use of vanilla beans and true buttercream. (The child initially requested Apple Martini, with its alluring sugar crystals disguising a vodka bite). I nudged my husband toward the Red Velvet Cream Cheese ($2.50), while I settled on the Brown Sugar Cinnamon ($2.50), which crumbled and melted in my mouth not unlike a muffin, yet the swirl of vanilla frosting brought the cupcake solidly back into the dessert realm. The Southern-inspired red velvet was also deemed a delight, with the cream cheese proving a perfect complement. Next time, we’re going to opt for the Chocolate Basil, or maybe the Elvis, billed as a peanut butter cupcake topped with chocolate/banana buttercream. My diet has just left the building. Cupcakes don’t really fit into my diet, because sometimes I don’t really fit into my clothes. It’s hard to justify going across Portland to the cupcake shop when I should probably be going down the street to the gym. But, yesterday I happened to be across the river at the baseball stadium with my dad, and since I don’t get over the west side very often I thought I’d better maximize the trip. I made a requisite stop at Powell’s, the legendary independent bookstore, and upon leaving noticed the recently opened Cupcake Jones (307 NW 10th Ave. at Everett). After a ballpark hot dog, I figured a little cupcake couldn’t hurt. Well, unfortunately for my diet, Cupcake Jones serves no ordinary cupcake. A Cupcake Jones cupcake is baked from scratch every day without shortening–so, no calories, right? 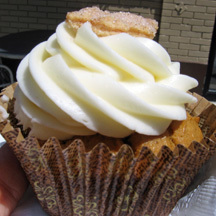 Except, the lack of shortening is probably more than made up for in–the real charm of a CJ cupcake–the filling. All of their “Jumbo” cupcakes (aka normal-sized, $3.25) come with a special filling that pairs with the flavor of the cake and icing–as in milk chocolate graham cracker pastry cream filling, homemade raspberry filling or chocolate chip cookie dough, to name just a few. The filling may be the shop’s signature, but it’s not all that sets it apart. The family that runs Cupcake Jones takes advantage of seasonal ingredients and uses fresh whole eggs. They add fruit instead of food coloring to the frostings, and they make every effort to be as green as possible (they even make cupcake deliveries using public transportation). So before I even had my first bite, I felt like I’d made a socially responsible, if not a personally responsible decision. Not that I needed any extra incentive after I saw the menu. Cupcake Jones features a monthly and daily rotating menu, available on their Web site. They continuously offer three standard cupcakes: an elaboration on the basic chocolate, a fancy vanilla and a coconut lemon. Each weekday also features three more rotating specialty flavors–anything from tiramisu to creme brulee to moon pie. The Tuesday I stopped in happened to be “Christmas in June” day, which featured pumpkin pie, gingerbread cookie and white chocolate chai cupcakes. After grilling the server for potentially useful insider information and a long deliberation process, I chose the pumpkin pie (photo), while my dad stuck to chocolate. I tried a bite of his (devil’s food cake with sour cream chocolate ganache with fudge icing sprinkled with chocolate shavings) and found it a rich and deliciously over-the-top chocolate, just how I like it. But I felt this rare cupcake shop visit called for something a little more out of the ordinary. My cupcake was a pumpkin spice cake filled with vanilla bean pastry cream and topped with cream cheese frosting and a homemade cinnamon sugar pie crust cookie. A few bites in, I realized the cake could have used a bit more spice to really make the pumpkin flavor pop, and I decided the vanilla bean flavor of the filling faded into obscurity next to the frosting. Cupcake Jones nailed the cream-cheese frosting (the true test of a cupcake shop as far as I’m concerned)–perfect, sweet, homey cream cheese flavor without much greasiness. And a good cupcake to frosting ratio, too (the filling helps here). The sugar cookie garnish pushed me over the top, and just when I felt the gooey cupcake richness was about to make me pass out (in a good way), it was gone. Maybe I should have tried one of each flavor in the bite-sized, unfilled mini cupcakes ($1.50), but I guess I can always go back tomorrow. That is, of course, if my pants still fit.